First single from the debut album by Ralph Stanley II & The Clinch Mountain Boys. I can't review the entire album-I haven't figured out how to download it, or perhaps the entire album isn't yet available for dowload yet. HOWEVER, the title song "Going Around This World" is a real winner. 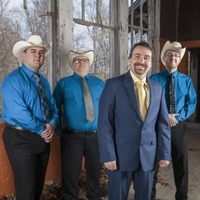 It is Stanley music, sung by the new head of the Stanley sound, Ralph Stanley II & The Clinch Mountain Boys. Ralph II's voice is one of the best I've ever heard-ever. Regardless of what type song he sings, his voice is clear, pure, & as old as most of the Clinch Mountains-it's not the tenor of his father, but his own rich, lonesome sound which to me is a result of all who have gone before him, Ralph & Carter Stanley, Keith Whitley, Ricky Scaggs, and so many other bluegrass musicians. Daddy & Ralph tried to improve their own sound & the band's performance sounds all the 20 years they were together at the birth of the Stanley sound. Ralph, Sr tried to do the same for all those years he slogged on, performing thousands of times the sound he knew the best. Ralph Stanley II's voice and the band's sound on "Goin' Round This World" are the wonderful result of tight harmony, just plain good instrumentals, the back-up voices are tight & sweet, but the sweetest of all is Ralph II's lead voice which is a wonder to behold here & on everything else he sings. This one belongs in MY collection & yours-it's the Stanley Sound at it's best!! !